Startlingly honest and empathetically written, HE LOVES ME! reveals the facts of God's relentless grace. Readers will learn how to live consciously, confidently in this love all the time. Questions for personal reflection and group discussion help make these truths practical and life-changing. Insecure Christians ready for a revolutionary relationship with God will find out just how accessible that is. This book brought healing after church abuse. If you have trouble believing God loves you, read this book! Best book I ever read. Helps you to see How much God loves you regardless how you don't love Him. Enlightening - full of "Oh, I get it now" insights for me! What a great feeling while being led to understand more about God's immeasureable love and be freed from the guilt that Organized Religion uses so effectively to get us to carry out their self-serving programs. I think this author has been living in my head! He has opened Bible story after Bible story to show me a loving God in a new light. I sense that this amazing relationship is what I have been longing for and looking for in all the wrong places. The problem has not been my church, or a particular style of worship. It has not been my own failures, even though they are many. The problem has been my focus on my persistent personal efforts to earn God's favor, and my lack of understanding that He has loved me all along. May God give me the courage to embrace His acceptance and freedom. 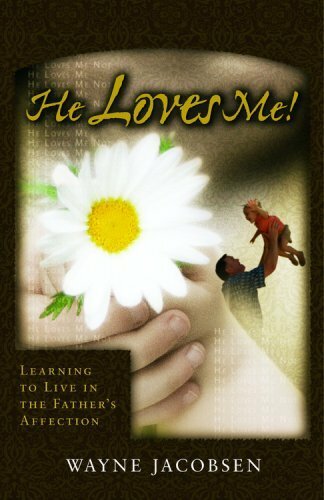 This is the BEST explanation of the Father's love I have ever read! So much becomes clear as you discover page after page of insights into the eternal. Everyone should read this! Whether you are reacting to the offer of relationship with the Father through rebellion or religion - you need to come home. This book will point the way home. This is the perfect book to read after "The Shack". Although I strongly believed everything this book has to say, it was a really good way to reinforce my beliefs.